These sculptural weavings are examples of our many styles and color combinations. We will gladly customize size and color for your home or office. The price can range from $800–$3,800, and up. 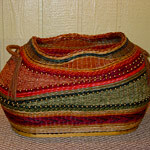 You can also view Wall Hangings, Santa Fe Chickens, Installments or all baskets.